Workplace injuries lead to substantial difficulty, especially if you cannot work until you recover. That is why New York requires every employer to carry workers’ compensation insurance. It can ease your recovery by paying medical bills and reimbursing you for lost wages. But if your employer or insurer interferes with your claim, a difficult situation becomes more challenging. Here is what to know about workers’ compensation claims and your rights. Seek medical treatment immediately. If serious, report to an emergency room. Delaying treatment can make it easier for your employer, or their workers’ compensation insurance carrier, to argue that the injury was not work related. Next priority should be notifying your employer. You have 30 days to do so, but it is better for your case if you notify them immediately. That allows for any benefits to kick in sooner and helps you appear credible. Many fraudulent claims arise from employees attempting to claim an injury was work-related way after the fact. Finally, complete a claim information packet and file it with your local Workers’ Compensation Board (WCB) office. You have two years to file this information and if you hire an attorney, they will help you with this step. How should my employer follow up on my injury report? If your employer hears of the injury before you receive medical treatment, they should release you from work so you may proceed to a healthcare clinic. They may will refer you to a healthcare provider who is authorized by the WCB. This does not apply if you were injured in an emergency situation. However, employers are not allowed to insist that you use a particular provider. Self-insured employers may insist you stay in-network but if you have a provider you prefer, you have the right to seek treatment from them. Chances are, if you have employer-provided health insurance, your medical provider is already in-network, so this usually is not an issue for most employees. Once they are aware of the injury and its circumstances, your employer should investigate and report the claim to their workers’ compensation insurance carrier. They may also fill out a Form C-2F which is their report of your injury to the WCB. Will I receive lost wages while I am recovering? If your employer pays your wages, they can be reimbursed by the WCB. It is often recommended they do so for the first week since injuries arising from workplace conditions may arise from employer negligence. In that case, your employer will owe you for lost wages anyway. After the first week, you are eligible for workers’ compensation benefits. These amount to two-thirds of your average weekly wage. Currently, these benefits are set to a weekly maximum which at this time is $870.61. This changes every July. If there is negligence involved in your injury, then your employer could owe you the difference between the benefit and your regular wage. This is pursued in a damages action and is also relevant if your injury is so severe as to render you incapable of working at your previous occupation. 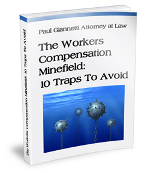 Employers cannot fire employees who file for workers’ compensation benefits. The same is true of any coworkers who testify on your behalf if your claim goes to hearing. Employers are not allowed to retaliate against workers who file or participate in a claim. If you are terminated for pursuing workers’ compensation, your employer may face a fine ranging from $100 to $500. You may also be able to pursue a civil action under the Americans with Disabilities Act. If you are terminated and suspect discrimination, file Form DC-120 with the WCB to start a investigation. If the WCB finds that you were improperly discharged, the WCB will order your former employer to restore your job and any lost wages. I suspect that my employer is in violation of workers’ compensation laws. What should I do? All New York employers must carry workers’ compensation insurance. If you are discouraged from seeking medical treatment or making a report, there is a good chance that your employer is in violation of the law. Once you receive medical treatment, fill out the online whistleblower form. This will start an investigation from the WCB. Next, you may need to hire an attorney. There is a good chance that you may need other avenues for ensuring you receive medical treatment and wage compensation. Sometimes, workplaces with a high rate of injuries attempt to keep claims from being reported, even if they carry insurance. If you run across this evasive behavior, it is likely you may be in for a fight because your employer is attempting to avoid a premium increase. Workers’ compensation is your right in New York when you sustain a workplace injury. You should not be terminated for filing a claim and your wage loss and medical bills should be covered. 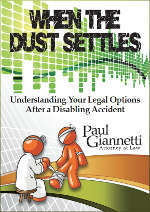 Paul Giannetti, Attorney at Law, is dedicated to helping injured workers. For help on your claim, contact our office today to schedule a free consultation.